In 2015, NASA released a document that described how we get from where we are today to boots on Mars. This involves continuing our research on the International Space Station (ISS), then moving humans beyond low-Earth orbit to the proving ground - the region near the moon where we can push the limits of our capabilities in a place where we can safely return astronauts home in a few days. We will continue to robotically explore Mars – as we are currently doing as an international community with numerous spacecraft – from NASA’s Curiosity rover to India’s Mars Orbiter mission. We will use these and future missions to Mars to reduce the risks of landing humans on Mars, from better understanding the structure of Mars’ atmosphere to its potential for providing local resources for future explorers. By the 2030s, we will be ready to move humans toward the Red Planet. Private sector partnerships are critical to enable us as a global society to explore Mars. NASA has been working on this by turning over to the private sector some work that we no longer need to keep as government-only functions, like launching cargo to the ISS, and soon commercial companies will be shuttling humans to the space station. We also are testing new technologies with private companies on the ISS, such as 3D printers that could make space exploration more sustainable. In addition to exploration technology development and demonstrations on the ISS, we also are doing critical research to ensure that we can keep humans healthy for periods of time in space, mitigating health risks such as bone density loss and muscle atrophy. Why send people to Mars? Some might wonder about why sending humans beyond low-Earth orbit to Mars is important, and whether it is worth the cost. Scientifically, Mars is our destination because scientists have determined that Mars is the most likely place to find evidence of life beyond Earth. Water, which is critical to life, was stable on the surface of Mars for around a billion years. Based on what we know about the evolution of life on Earth, life is likely to have arisen on Mars. In that time period, life may not have gotten very complex, so it will likely take astrobiologists and geologists on the surface of Mars to find evidence of ancient microbial life. The evidence of liquid water on the surface of Mars also makes scientists wonder if life could have persisted on Mars, moving underground as conditions became increasingly inhospitable at the surface. But we explore for more reasons than science. When nations do really hard things, they achieve much, innovating and developing new technologies and capabilities. The technologies that we develop for space often have very practical applications here on Earth. The water purification system used on the ISS is currently helping provide clean water in remote areas on this planet. The development of NASA’s new Space Launch System and Orion capsule, that will be used in human exploration beyond Earth have led to things as varied as faster ways to charge batteries, advanced manufacturing techniques, and lighter aircraft structures. A country that invests in space exploration invests in the future, and in doing so reaps economic benefits that spur the development of new companies and new capabilities. 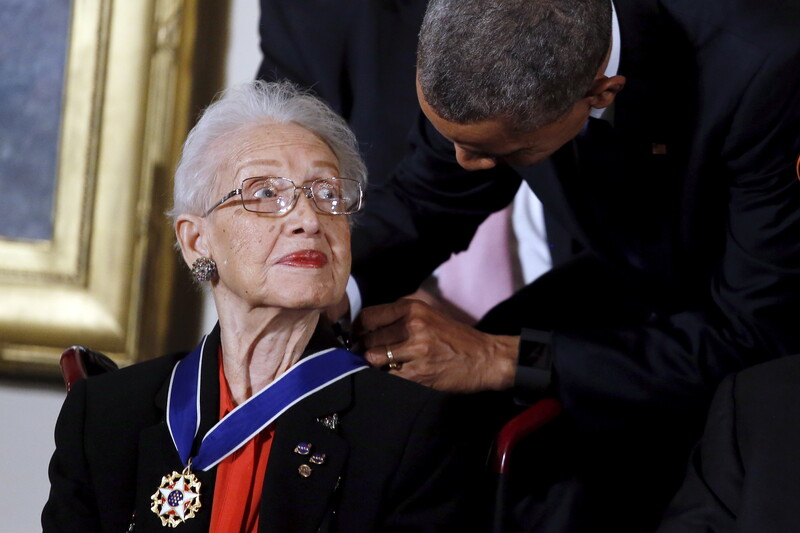 We need all hands on deck for this far-reaching mission, including women and individuals from other underrepresented groups, like Katherine Johnson—an African American women identified as a hidden figure in the nation’s space program. When initially hired by NACA — NASA’s predecessor in 1953 — she was called a “human computer” because of her superb mathematics skills. She calculated the trajectory for the first American in space, Alan Shepard. Even after NASA began using electronic computers, John Glenn asked that she personally recheck the calculations prior to his flight aboard Friendship 7. While she had to endure many obstacles during this period in American history, she persevered because she knew her skills were relevant and needed. Next January, the movie Hidden Figures premieres in theaters, based on the true story of Katherine Johnson and other African American women who worked for the agency at that time. Katherine was awarded the Presidential Medal of Freedom – the nation's highest civilian honor – in November 2015. With people like Katherine at the table, we can accomplish anything. As President Kennedy said of the journey to the moon, we don’t do this because it is easy. We do it because it is humanity’s next big challenge – to move humans beyond this planet. We must do this in innovative new ways, as an international community, and hand-in-hand with the private sector.